Was I ever going to be able to get out of this pit? Was I always going to feel buried by shame? Was I ever going to be able to experience freedom? I remember, I had gotten to a place of being able to fully acknowledge the presence of my soul wounds. I had acknowledged them. But it wasn’t easy. Every day I was desperate to get out doors to run, just to process the broad range of my emotions – anger, sadness and grief. I knew the process was necessary – I couldn’t live like I had been – but I was feeling fearful of having to clean out my wounds. As I ran down the boardwalk on one particular morning, I prayed for God to meet me in my pain and fear. Then a picture came to my mind. I was trying to climb my way out of an impossibly deep, sandy pit. I envisioned myself trying to climb out, but my attempts being of little use. I was overwhelmed by the height I needed to climb in order to be free. Every time I began climbing and clawing, the sand just kept giving way. There was no possibility I was going to get out on my own. Then I looked up – past the wall of sand – toward the bright, blue sky. And there was Jesus. Reaching and extending his arms down to me. I locked my arms with his and looked up into his eyes, as he said, “Keep your eyes on me”. That vision was one of the gifts that carried me through the intensely challenging season of dealing with my ‘stuff’. There is no question – it is difficult to truly look at our wounds. But if we want to heal, we can’t just coddle our wounds and wish them away – we must clean them out so they can truly heal. This vision reminded me that Jesus was WITH me and He was promising to pull me from the pit I had been stuck in. Keep your eyes on Jesus, who both began and finished this race we’re in. Study how he did it. Because he never lost sight of where he was headed – that exhilarating finish in and with God – he could put up with anything along the way: Cross, shame, whatever. And now he’s there, in the place of honor, right alongside God. When you find yourselves flagging in your faith, go over that story again, item by item, that long litany of hostility he plowed through. That will shoot adrenaline into your souls! Have you ever felt stuck in a pit before? 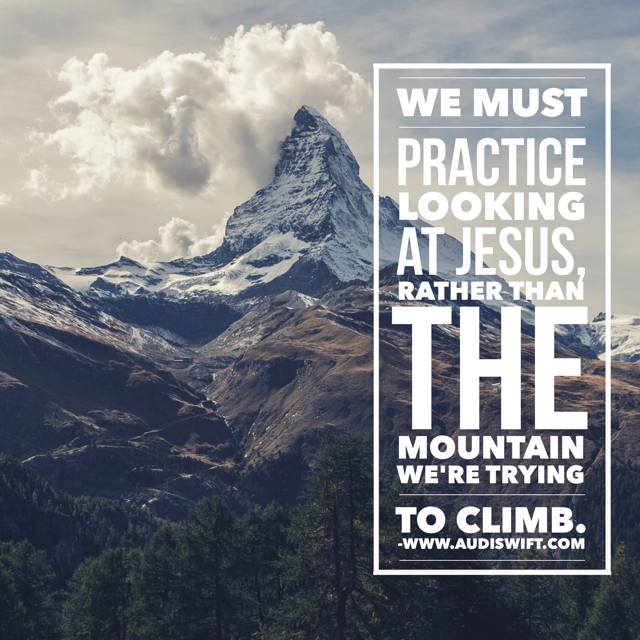 How can you begin to practice setting your eyes on Jesus instead of your mountain?